We’d love your help. Let us know what’s wrong with this preview of The Pericles Commission by Gary Corby. Nicolaos walks the mean streets of Classical Athens as an agent for the promising young politician Pericles. His mission is to find the assassin of the statesman Ephialtes, the man who brought democracy to Athens and whose murder has thrown the city into uproar. It's a job not made any easier by the depressingly increasing number of dead witnesses. But murder and mayhem don Nicolaos walks the mean streets of Classical Athens as an agent for the promising young politician Pericles. His mission is to find the assassin of the statesman Ephialtes, the man who brought democracy to Athens and whose murder has thrown the city into uproar. It's a job not made any easier by the depressingly increasing number of dead witnesses. But murder and mayhem don't bother Nico; what's really on his mind is how to get closer (much closer) to Diotima, the intelligent and annoyingly virgin priestess of Artemis, and how to shake off his irritating twelve year-old brother Socrates. To ask other readers questions about The Pericles Commission, please sign up. The Publisher Says: Nicolaos walks the mean streets of Classical Athens as an agent for the promising young politician Pericles. His mission is to find the assassin of the statesman Ephialtes, the man who brought democracy to Athens and whose murder has thrown the city into uproar. It’s a job not made any easier by the depressingly increasing number of dead witnesses. My Review: A Mouldering Mound of ~Meh~ read. Nico's coming of age as an Athenian and a politician was not without interest, and the love-match he wants to make with Diotima is a bit amusing, but the overall action contains few moments of surprise and almost none of suspense. It passed some time, and I cared enough to finish it, but unless the next one grows wings and flaps in my door by itself, this will do it for me. This first mystery novel by Gary Corby was surprisingly fun and i'm looking forward to the next books in the series. Not only was it fun, but it has increased my interest tenfold to finally buckle down and learn about Antiquity by reading classic texts and other history books i have lying around. I gave it four stars, but in some ways it is a (strong) 3.5 star book for me. Some of the writing was a little uneven and had it been another author i may have bumped it down to three stars, but i know This first mystery novel by Gary Corby was surprisingly fun and i'm looking forward to the next books in the series. Not only was it fun, but it has increased my interest tenfold to finally buckle down and learn about Antiquity by reading classic texts and other history books i have lying around. I gave it four stars, but in some ways it is a (strong) 3.5 star book for me. Some of the writing was a little uneven and had it been another author i may have bumped it down to three stars, but i know this is a first novel and i also know that the author is incredibly nice, funny, and smart, so therefor 4 stars. Anyway, I thought Corby did a great job with dialogue, particularly when Nico was working out the puzzle and examining evidence with his secret sidekick, but some of the action scenes became a little tiresome for me--but i'm a girl! also, the book moves swiftly and those scenes in all honesty did nothing to detract from the book in any meaningful way. I also liked Corby's method of describing the scene of ancient Athens (places and people and the homes they lived in, how they interacted, and how they got their work done), and explaining what things were. I don't know what a classicist would think of it, but for me (a stranger in a strange land), it was most appreciated. and perhaps most importantly, Corby did a phenomenal job of setting up the plot--immediately Nico had a handful of compelling suspects, all with motives. Added to that, he was a likable (albeit naive) chap, who constantly endangered himself making enemy upon enemy throughout his investigation. This did everything to keep the reader fully engaged and invested in the story to find out if Nico can solve the riddle AND avoid death. If you are looking for a light cosy type mystery with a different setting then this may well be the book for you. Just don't expect more than that as the historical setting is mostly of the wallpaper variety and although the mystery involves a political assassination this is in no way a political thriller. It definitely isn't in the same league as some of the mystery series' set in Ancient Rome which is what I'd hoped for, but more a fluffy bit of fun. A fictional investigation into a historical murder. Corby does a good job showing his reader daily life in 461 B.C. Athens (and I wish that I had discovered the glossary at the end earlier!) and provided enough explanation of the politics at the time (which were a factor in the murder). I also appreciated his Author's Note at the end which explained which parts where historical, which reasonable guesses and which entirely fictional. One historically accurate bit took me aback -- in this time & culture, if a man died without sons his widow was required to marry the closest possible male relative. If that man happened to be already married, he was required to divorce so as to marry the widow! The divorced wife would be sent back to her family. 'Cozy' mystery set in ancient Athens, at the birth of democracy. I enjoyed it well enough; adjectives I'd use are: silly, farcical, humorous, at different points in the story. A man is shot with an arrow and falls at the feet of Nicolaos, the protagonist. Apparently, the victim has fallen from the sky. Nico is commissioned by Pericles, the politician and one of the founders of democracy, to find the killer. Pericles just happens to come by right then. Nico decides he wants to be a politician and 'Cozy' mystery set in ancient Athens, at the birth of democracy. I enjoyed it well enough; adjectives I'd use are: silly, farcical, humorous, at different points in the story. A man is shot with an arrow and falls at the feet of Nicolaos, the protagonist. Apparently, the victim has fallen from the sky. Nico is commissioned by Pericles, the politician and one of the founders of democracy, to find the killer. Pericles just happens to come by right then. Nico decides he wants to be a politician and not follow his father into the sculpture business. Through many twists and turns, the young man does find the killer. His young brother, Socrates, who can be annoying at times but has some good insights, along with a priestess-in-training help him in solving the crime. He himself is arrested for treason and faces a death sentence, before the denouement. A good deal of the novel was a satire on politics; politicians haven't changed all that much in millennia. To paraphrase [I loved this sentence]: oh, no, we'd never elect an actor to high office. This is the first book of the "Athenian Mysteries" and I really liked it. The plot is based on the true story of Ephialtes' assassination. The crime investigation is led by his lieutenant - Pericles and his friend, Nicolaos, whose brother is Socrates. With plenty of mystery and humor, the author describes quite well the set in fifth-century B.C.E. Greece. A promising series to be followed. Thanks dear Bettie to provide this "book wit a passport:, I really enjoyed it. A fun little historical mystery. Recommended for fans of the flipness of Falco. For a further review: http://susannag.booklikes.com/post/68... .
Did not finish. I just can't get into cozy mysteries. I don't need graphic violence or extreme psychological drama, but maybe an edge or some depth to keep things interesting. I also can't seem to enjoy historical fiction. The history part, while interesting on a factual level, doesn't engage me. This book itself feels like a slapstick comedy which i've never enjoyed. Would have likely been 2 stars. I picked this up totally on a whim at the library, the cover kept catching my eye, and I'm very glad I did. This was a fun mystery with likable characters and a lot of wit. While the overall tone of the book was pretty lighthearted it didn't shy away from some of the uglier sides of life in Ancient Athens. It never comes across as a lecture but the fate of slaves, women and basically anyone else who wasn't a "citizen" isn't candy coated. But for all that the book is actually great fun. Certain r I picked this up totally on a whim at the library, the cover kept catching my eye, and I'm very glad I did. This was a fun mystery with likable characters and a lot of wit. While the overall tone of the book was pretty lighthearted it didn't shy away from some of the uglier sides of life in Ancient Athens. It never comes across as a lecture but the fate of slaves, women and basically anyone else who wasn't a "citizen" isn't candy coated. I won a copy of THE MARATHON CONSPIRACY, the fourth book in the series, in a Goodreads giveaway, so I hurried to the library to check out the first book and read the series in order. What a discovery! Greek history, lots of humor, a yummy young hero, and a romance thread--what's not to love? This was a fun read, and I look forward to reading the next installment. Updated 4/12/15: Some mysteries don't stand up to re-reads; once you know "whodunnit," there's just not enough to make a return trip sa I won a copy of THE MARATHON CONSPIRACY, the fourth book in the series, in a Goodreads giveaway, so I hurried to the library to check out the first book and read the series in order. What a discovery! Greek history, lots of humor, a yummy young hero, and a romance thread--what's not to love? This was a fun read, and I look forward to reading the next installment. This is the book I've been searching for! I was teaching my children Greek history and my daughter, 13, is just fascinated by this subject. I get so caught up in their studies, so I wanted something fun to read set in Classical Greece. I couldn't wait to start this book and I was not disappointed at all! I passed it on to my daughter at once and she is enjoying the mystery along with the reinforcement of some history. There is nothing in this novel that a 13 year old has not already seen on TV an This is the book I've been searching for! I was teaching my children Greek history and my daughter, 13, is just fascinated by this subject. I get so caught up in their studies, so I wanted something fun to read set in Classical Greece. I couldn't wait to start this book and I was not disappointed at all! I passed it on to my daughter at once and she is enjoying the mystery along with the reinforcement of some history. There is nothing in this novel that a 13 year old has not already seen on TV and they will recieve a bit of a history lesson! This book is about a murder mystery set in ancient Greece during the time of the history's earliest democratic movement. The leader of the movement is murdered and the commission for investigating the assassination accidentally falls upon Nicolaos who is currently a no-one, and sees this as an opportunity to make his name in Athenian politics. The plot seemed interesting and series of murders that follow makes the case more complex but Nicolaos is no Hercule Poirot and the way investigation prog This book is about a murder mystery set in ancient Greece during the time of the history's earliest democratic movement. The leader of the movement is murdered and the commission for investigating the assassination accidentally falls upon Nicolaos who is currently a no-one, and sees this as an opportunity to make his name in Athenian politics. Of course Ancient Greeks didn't "sound" Australian, but there's nothing wrong with the idea that they had senses of humour, the ability to comment on their own actions, and a strong understanding of the way that the world in which they moved worked and if that feeling has to be imparted in a way that we can "get" why not in our sort of voice? At first the gentle humour and the very Australian voices in THE PERICLES COMMISSION came as a bit of a surprise, albeit a rather pleasant one, but the mor Of course Ancient Greeks didn't "sound" Australian, but there's nothing wrong with the idea that they had senses of humour, the ability to comment on their own actions, and a strong understanding of the way that the world in which they moved worked and if that feeling has to be imparted in a way that we can "get" why not in our sort of voice? At first the gentle humour and the very Australian voices in THE PERICLES COMMISSION came as a bit of a surprise, albeit a rather pleasant one, but the more I read this book, the more I realised that the voice works. Mixed in with sufficient historical perspective and details, this book could work for fans of historical crime fiction, just as it would be a perfect introduction for readers who have steered clear until now. The story told is as old as the setting though - politicians fighting for power, for their version of politics, for their view of the world. Nicolas, the son of a sculptor is only given the task of investigating this death because he happens to be the man on the spot. His reactions impress Pericles, a supporter of democracy (from the same "side" as the dead man), so Pericles commissions Nicolas. There's a lot of detail in the book about the whys and wherefores of how these sorts of things normally work in Ancient Greek society, as there are details about the various political movements - but the delivery of that detail is not heavy handed. At no stage did I feel like there was definitely going to be an exam at the end of this book, the details just flowed into the narrative. There is a large cast of characters and one of those cast listings at the front (including a pronunciation guide). More importantly the real-life characters are also indicated and it's interesting to see how Corby has woven fact into fiction in what seems to this reader, at least, a seamless manner. One of the more appealing parts of the book was definitely the way that it seemed to be providing a bit of a history lesson, woven into a really interesting tale - making the history both palatable and very real. As with all these sorts of lone, private, accidental investigators, a lot of the enjoyment of the book hangs on whether or not a reader can believe the situation. There's something very believable about Nicolas taking up the investigator role - despite absolutely no experience, ability, training, or even much of an idea of how to start. Sure there's a fair amount of him acting as a catalyst for events, rather than a finder of facts, but facts he does discover, and he does garner help from some unlikely quarters including a love interest. Ephialtes, illegitimate but acknowledged daughter of the dead man is a great character, although you are going to have to brace yourself for a bit of that romantic carry on. Not too much thankfully, and nicely balanced out with Ephialtes being no shrinking violet and not afraid to get into the action in her own right. There are other great characters in this book, and there are some excellent insights into the setting and the period (albeit that I have no way of knowing how accurate any of it is - but it certainly feels, reads and sits well within the context of the story). Ultimately what really works if the character of Nicolas himself. His dogged determination to make his own way in the world, his relationship with his father, mother and younger brother Socrates (make of his name and description what you will), and his way of seeing the world around him made this a really engaging, light, fast and ultimately extremely enjoyable book. The Pericles Chronicle is a fictional account of an investigation into the assassination of Ephialtes, who was an actual historical figure killed in 461 BC a few days after introducing democracy in Athens. The investigator, who serves as narrator, was an imaginary figure created by author Gary Corby as the older brother of Socrates when he was a boy. In addition, many of the events, although plausible in view of what is known of the period, were also invented. As Corby acknowledges in the afterw The Pericles Chronicle is a fictional account of an investigation into the assassination of Ephialtes, who was an actual historical figure killed in 461 BC a few days after introducing democracy in Athens. The investigator, who serves as narrator, was an imaginary figure created by author Gary Corby as the older brother of Socrates when he was a boy. In addition, many of the events, although plausible in view of what is known of the period, were also invented. As Corby acknowledges in the afterword, the investigator's trial on trumped up charges descends into farce. So we are dealing with a hybrid here--part fiction and part fact. The book has educational value to the extent that it is based on actual individuals, events, places, and customs and attempts to depict daily life in Greece in the period between the Greco-Persian Wars and the Peloponnesian War between Athens and Sparta. However, education is balanced by entertainment, as the author amuses the reader with the antics of a high-end courtesan--known then as a hetaera--and her equally voluptuous daughter, a priestess in training. The combination of education and entertainment makes reading the Pericles Commission a worthwhile and pleasant experience. Ancient Greece, often characterized as the cradle of civilization, continues to intrigue us. I would like to compare Corby's lighthearted approach with the 'Trial of Socrates' by the late I.F. Stone, the American journalist and apparent Soviet spy who taught himself ancient Greek in retirement in order to perform a 20th century investigation of the circumstances of Socrates' conviction for impiety by analyzing original texts. Really enjoyed this book! And for a first novel, an incredibly strong one. If you like any of the ancient Rome historical mysteries or just that genre in general, you should also like this one. Ancient Greece is a tough one I think to get right--even though a democracy, far more alien I think to us now, than the more familiar republic or empire of Rome. Perhaps partially because of how the Greeks treated women (not human, on par with animals, who could be killed for basically any whim and were n Really enjoyed this book! And for a first novel, an incredibly strong one. If you like any of the ancient Rome historical mysteries or just that genre in general, you should also like this one. Ancient Greece is a tough one I think to get right--even though a democracy, far more alien I think to us now, than the more familiar republic or empire of Rome. Perhaps partially because of how the Greeks treated women (not human, on par with animals, who could be killed for basically any whim and were not allowed to leave the house). I find it interesting that perhaps one of the greatest generations to walk the earth during that Golden Age of Athens also had such a disgusting view of women -- but maybe that too isn't 100% if you think about Aspasia or the strong roles women played in their fiction and religion. Anyways, Athenian treatment of women is one of the main subplots of the book, but it's not done in an annoying way--you like the hero, young Nicolaos trying to investigate the murderer of a politician whose corpses literally landed at his feet, who is the father of young priestess, Diotima. A very enjoyable book, that I found hard to put down. I was on holiday yet kept sneaking in time during sightseeing as the book really drew me in. It has wonderful characters, humour and detailed descriptions of ancient Athens. The characters are drawn out beautifully. While some reviewers have questioned whether the characters are authentic and original to the time period, I would say for me, the experience was enjoyable as they were as authentic as possible while writing in the today's languag A very enjoyable book, that I found hard to put down. I was on holiday yet kept sneaking in time during sightseeing as the book really drew me in. It has wonderful characters, humour and detailed descriptions of ancient Athens. The characters are drawn out beautifully. While some reviewers have questioned whether the characters are authentic and original to the time period, I would say for me, the experience was enjoyable as they were as authentic as possible while writing in the today's language and tone. I would not have enjoyed a book that tried too hard to replicate the language and tone of the times as it would have been hard to contemplate and emphathise with the characters. I feel comfortable that they were true to their times but represented in today's language. There is also enough historical evidence from the author's note to back up some of his ideas. The ideas represented are very plausible, credible and believable thus draws the reader into the story. If you are looking for a great time learning about the details of ancient Athens, and how the foundations of modern democracy was laid, then this book will do it for you. It needs to be savoured though so this is not for anyone interested in a quick read, downed in a gulp. And he is Australian! which, irrelevant as it is, felt good! An ancient Athenian murder mystery. Simple (that's a compliment); maybe "clean" is a better way to describe it. I find the protagonist's "stoicism" (an anachronism, since the events take place 150 years prior to Zeno's earliest teaching) to be too artificial. And I'm always leery of strong female characters in fictional antiquities; although in his end Note, the author claims scholarly support for both the situation, and the particular female character (confirmed by Wikipedia). So I'm going to g An ancient Athenian murder mystery. Simple (that's a compliment); maybe "clean" is a better way to describe it. I find the protagonist's "stoicism" (an anachronism, since the events take place 150 years prior to Zeno's earliest teaching) to be too artificial. And I'm always leery of strong female characters in fictional antiquities; although in his end Note, the author claims scholarly support for both the situation, and the particular female character (confirmed by Wikipedia). So I'm going to give him a pass on this one. Perversely, I had the experience of both not wanting to put down the book once I started reading; and not wanting to pick it up again once I'd put it down. I'll mark that as due to the fact that its neither science fiction nor computer technical, rather than anything wrong with the author. So this book probably deserves 4 stars. But I can only rate it for myself, right? This book had a fun concept (solving a murder in newly democratic Athens) and covered an interesting time (apparently) historically accurately. I'm only giving it three stars, though, because of the writing style. First, I thought it felt overly simplistic and written down -- it sounds like a young adult novel at times, and I don't think it's supposed to (given that a courtesan is a main character, etc.). Second, I had a hard time keeping track of the characters, even with the character list in This book had a fun concept (solving a murder in newly democratic Athens) and covered an interesting time (apparently) historically accurately. I'm only giving it three stars, though, because of the writing style. First, I thought it felt overly simplistic and written down -- it sounds like a young adult novel at times, and I don't think it's supposed to (given that a courtesan is a main character, etc.). Second, I had a hard time keeping track of the characters, even with the character list in the front of the book. Few of the characters had any real personality, and with all the unfamiliar names, they just blended together. This probably goes in hand with the simplistic writing -- everyone seemed two dimensional. Historic mysteries are fab for me. I get the mystery and I get to learn something about a certain time in history. Ancient Greece is the setting here and politics are at the center of the story. The main character, Nicolaus or Nico, is looking into what to do with his life. Does he want to go into politics and make a difference in Athens or become a sculptor like his father? His decision is sort of made for him when he witnesses the murder of a leading statesman and is set on the investigation p Historic mysteries are fab for me. I get the mystery and I get to learn something about a certain time in history. Ancient Greece is the setting here and politics are at the center of the story. The main character, Nicolaus or Nico, is looking into what to do with his life. Does he want to go into politics and make a difference in Athens or become a sculptor like his father? His decision is sort of made for him when he witnesses the murder of a leading statesman and is set on the investigation path. The story moves along at a fairly brisk pace. Excellent characters showing rich and poor lifestyles. And there's the intrigue. I do look forward to reading the rest of the series. 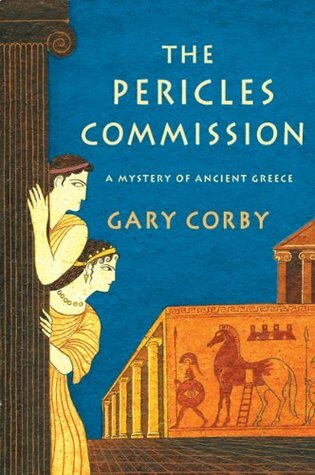 The Pericles Commission is a perfectly serviceable mystery set in ancient Greece. Sometimes the explanatory information is shoehorned inelegantly into the narrative, but there is a lot of background to go over for those readers (like me) who aren't aware of many facts of ancient Greek life. The murder mystery itself, though, left me a little cold. I wish there were more books in this genre. I feel that this book was not nearly as much fun as "Murder at the Panionic Games" by Michael B. Edwards, w The Pericles Commission is a perfectly serviceable mystery set in ancient Greece. Sometimes the explanatory information is shoehorned inelegantly into the narrative, but there is a lot of background to go over for those readers (like me) who aren't aware of many facts of ancient Greek life. The murder mystery itself, though, left me a little cold. This was a reasonably good mystery, with plenty of twists and turns as well as humorous moments. The author did a good job of educating the reader on the life and times of ancient Athens without sounding like a history lecturer. I thought it was over-long though, and it didn't make me feel a strong urge to go out and get the sequel. A solid B. If you liked this book I would recommend the book Ancient Athens on 5 Drachmas a Day, a nonfiction title with a similar feel and, obviously, the same setti This was a reasonably good mystery, with plenty of twists and turns as well as humorous moments. The author did a good job of educating the reader on the life and times of ancient Athens without sounding like a history lecturer. I thought it was over-long though, and it didn't make me feel a strong urge to go out and get the sequel. A solid B. Having read book 6 first, I hoped that the debut book would not be a disappointment. It wasn't! This book has more details about ancient Greek culture and everyday life than The Singer from Memphis, but otherwise it is again a fun story set against an event in Greek history. The nice understated wry humor is also here but perhaps not quite as strong as in the 6th book. I'd be hard-pressed to say which I enjoyed more. I'm a new fan-- I read the 3rd book first, which was a teeny bit of a spoiler,but I also liked it so much I went back and read all of them from the 1st--which is this book--The Pericles Commission. I love his ability to tell a ripping good story while revealing the most fascinating bits of ancient Greek culture. Never pedantic or lecturing he brings this world to life. This looks like the start to a pretty good series. I like the setting in Ancient Greece and the addition of actual real historical people as players in the story. The writing wasn't as polished as I'd have liked to read and the setting often felt a little too modern but I hold out hope that the next books will get better.